Small turtles seem like great pets, but they carry the dangerous bacteria salmonella. Don't risk your family's health. Small turtles, though cute and seemingly harmless, are silent carriers of the dangerous bacteria salmonella. Parents often mistake these adorable creatures as suitable domesticated pets, since they're ostensibly so benign. However, bringing a small turtle into a home with children can pose significant health implications. The FDA placed a ban on small turtle sales for this reason back in the 1970s, but a group of farmers from Louisiana is now suing the FDA and claiming the ban is negatively affecting their livelihood. But the fact is, there is simply no good that comes out of the sale of these animals. Aside from the salmonella issue, the turtles usually don't do well in captive environments. We need to stand up for the safety of our children and the turtles and continue to support the ban. Sign the petition asking FDA Commissioner Margaret Hamburg to confirm the legitimacy of the ban of small turtle sales. As the Commissioner of Food and Drugs here in America, you are probably aware of the health risks associated with small turtles. Though they look harmless, small turtles carry salmonella, and they often transmit the bacteria to children. The sale of small turtles was banned in 1975 because of the danger salmonella poses to young kids. Because salmonella can be particularly severe when contracted by children, allowing the sale of these turtles to resume would no doubt yield many more cases of juvenile salmonella. 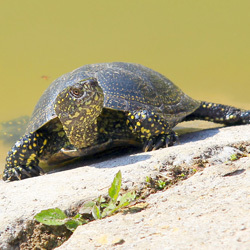 A captive life is also not ideal for a small turtle, who can grow to over a foot long upon adulthood. As a turtle matures, it becomes much more aggressive than it is as a young animal. I am writing to ask that you oppose lifting the turtle sale ban both for the health of our children as well as for the best interest of the turtles.